I took this picture yesterday when I was dusting the floor behind our computers. 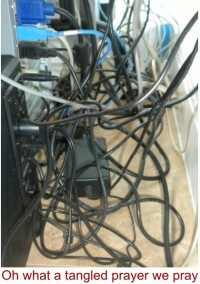 When you look at it you probably see a tangled mess of wires. When I look at it I see a perfect illustration of my prayer life. Maybe I’d better explain. You see, years ago in one of my Bible studies I learned to pray by using the ACTS method, which means you approach prayer in this order: First, Adoration, next, Confession, then Thanksgiving and finally, Supplication (which is a polite term for requests, concerns, and – dare I say it? – desires.) It’s an excellent tool. Unfortunately I’m not very good at it. For one thing I tend to race through the first three parts like I'm in some kind of Evelyn Wood speed-praying competition because admittedly what I’m really interested in is the supplication part. But then, oddly enough, once I finally get to that one, everything just seems to go haywire. For some reason I just have a really hard time staying focused. I’ve got all these people and things that I want to talk to God about, which would be fine if I would stick to the issues, but I don’t. Instead I get all balled up in the particulars and before long my mind has meandered hither and yon, up hill and down, until I’ve completely lost my train of thought altogether. Somehow I don’t think this is what God had in mind when He said, "Pray without ceasing.” (I Thes. 5:17). Prayer is worship. Prayer is communion. Prayer is fellowship. Prayer serves a purpose. Which brings me back to the photograph. If you’re familiar with this kind of stuff, you know that each and every one of those wires connects something important with something else important – as in computer to printer, hard drive to speaker, phone line to Internet, router to laptop, surge protector to everything! It’s an ugly mess back there but it does serve a purpose. Yank out a wire and you disconnect something you really need from its source of power. The same is true about prayer. Your communication with God may be flighty, circuitous (I love that word) disjointed, and at times even nonsensical, but it does serve a purpose. Stop praying and you disconnect yourself from your one true source of power – God Himself. If you think about it, the whole thing’s pretty miraculous. And speaking of miraculous, that’s the exact same word my husband used when he found out I’d dusted the floor behind our computers. Now doesn’t that make you want to yank out one of his wires? Search for Oh I Get It! articles similar to "Spaghetti Prayers. Search all articles similar to "Spaghetti Prayers".